I know someone who works at a nearby chocolate shop. As a result, I get a fairly large amount of chocolate that has “gone out of date”, and would be otherwise thrown out (why they don’t donate it somewhere or something, I don’t get). Anyway, I’ll be occasionally posting about various kinds of chocolate. 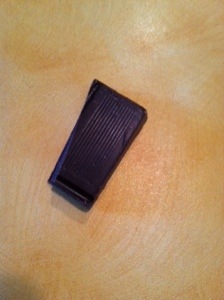 This time, I’m doing it with Clarity by Gnosis Chocolate. 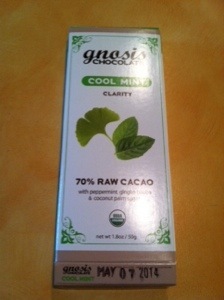 As you can probably see by the packaging, it is 70% raw cacao, which I don’t know if I’ve seen before. It is also sweetened with palm sugar, which is healthier than regular sugar (as well as tasting better, in my opinion). The ingredients also contain mint (obviously) and ginko biloba, which is rather surprising. There’s a piece of it. Nice and dark, but delicately sweet and flavourful. Quite good. One thing I’d have to say that I didn’t like in it was that, especially if you take a large bite, it is somewhat acidic. I think this is probably because it is raw, not roasted cacao, like the normal stuff. Overall, though, it is quite good. And hey, it was free. 19 May	This entry was published on May 19, 2014 at 12:22 pm. It’s filed under Chocolate, Uncategorized and tagged andrew, biloba, chocolate, clarity, ginko, gnosis, mint, vochman. Bookmark the permalink. Follow any comments here with the RSS feed for this post.